Daiichi Sankyo’s ongoing contempt case against former Fortis Healthcare promoters Malvinder and Shivinder Singh in the Supreme Court has once again highlighted the brothers’ financial woes. Once leaders of a flourishing, billion-dollar empire, the Singhs now seem to be struggling to pay a $500-million arbitration award to Daiichi for allegedly concealing information regarding wrongdoing at Ranbaxy, sold to the Japanese drug maker in 2008. The apex court last week reserved its verdict on whether the Singhs violated its 2017 orders not to part with unencumbered Fortis shares, earlier expected to be used to help pay this award. The case took a darker turn last year, when allegations of illegal diversion of the Singhs’ funds surfaced, some even by the brothers against each other. Yet, the question still remains—where did the money go? Lawyers for the Singhs had in 2016 and 2017 verbally assured the Delhi High Court that there were sufficient funds to satisfy Daiichi’s award. Yet, hearings in 2018 raised questions about these assurances. Soon after, a public rift arose between the Singhs, with each brother blaming the other for the family’s financial situation. 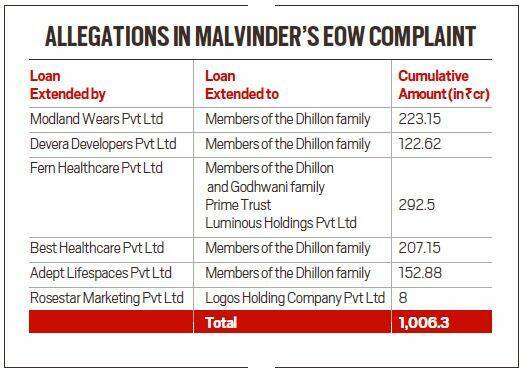 Shivinder, the first to “break” his silence through a statement in September 2018, blamed elder brother Malvinder for “oppression and mismanagement” of Fortis, Religare Enterprises and holding company RHC Holding, controlled by both brothers. In a petition at the National Company Law Tribunal (NCLT) that month, he alleged Malvinder colluded with ex-Religare chief Sunil Godhwani to take out funds totalling over Rs 1,200 crore through inter-corporate deposits (ICDs) and loans from Fortis Healthcare and a Religare Enterprises subsidiary to pay back creditors. He alleged such actions resulted in value loss to RHC “far in excess” of the amount loaned and had put it and several of the brothers’ companies in a “debt trap”. READ | SC to Fortis ex-promoters: How do you plan to secure Daiichi’s Rs 3,500 crore award? “For two decades now, Malvinder and I, Shivinder Mohan Singh, have been synonymous with one another. Though the fact is, I have all along been the publicly supportive younger brother to Malvinder’s chairmanship of the group, who took decisions on behalf of the family,” Shivinder said in his statement. He later withdrew his NCLT petition citing his mother’s insistence that the issue be resolved by mediation. In March this year, Shivinder further alleged in an affidavit to the Supreme Court that the value of unencumbered assets available to satisfy Daiichi’s award, including RHC’s stake in Fortis Healthcare Holding, eroded due to the Japanese company’s own “repeated” court applications objecting to any of the Singhs’ proposed talks to sell Fortis. RHC held stake in Fortis Healthcare through Fortis Healthcare Holding. In his 2018 statement and the NCLT filing, Shivinder said he took “public retirement” in 2015 to serve in spiritual organisation Radha Soami Satsang Beas (RSSB) and that, until October 2017, he was “not involved in the strategic operations” of companies like Religare or RHC. “The deponent (Shivinder Singh) humbly makes his position clear before this honourable court that the deponent is not and at all material times was not in control of the entities against whom any contempt is alleged,” his March 2019 affidavit states. Yet, it is Shivinder’s involvement with RSSB that Malvinder alleges is the main cause of the depletion of the Singhs’ wealth. In October last, Daiichi rushed to the Delhi High Court asking it to attach properties of several companies currently not a party to its ongoing case against the Singhs. Its lawyers alleged in court that the siblings, via companies controlled by them, were routing funds to downstream companies that further used the funds to settle debts of land-owning companies. Over Rs 2,500 crore was diverted this way, they alleged. “Show me the colour of money,” Daiichi’s senior lawyer often told the high court during proceedings to enforce its award. The Japanese firm had constantly moved court since 2017 to block the Singhs from closing a deal for Fortis while it was still under their control and has argued they have no intention to pay up, despite submissions by the brothers stating otherwise. Daiichi, in its application to the high court last year, claimed that respondents ANR Securities, RHC Holding, Ranchem and “Malvinder Singh, as trustee of Bhai Hospital Trust”, “hold and control” Prius Real Estate, in which they infused funds through debentures. According to the company, the book value of debentures held by these four entities in Prius Real Estate amounted to Rs 1,429.50 crore.